Clouds on Beechmont is fully self contained and beautifully appointed. Guests have access to an organic vegetable garden. Clouds on Beechmont offers a standard of comfort and luxury not easily found. 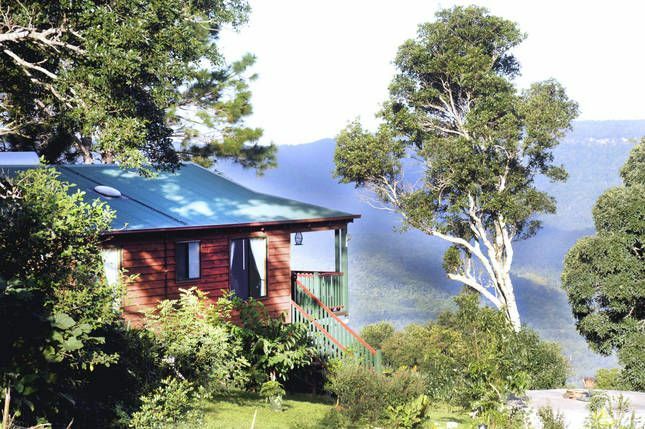 The view from the chalets veranda is simply breathtaking as it is situated directly opposite Lamington National Park, Binna Burra, Springbrook and Ships Stern. Clouds Chalet sits atop the Beechmont Plateau; just 40 minutes form the Gold Coast and an hour from Brisbane. Clouds on Beechmont offers easy access to all the Hinterlands' Favourite tourist destinations and the great local wineries trail. Visit our website for more accommodation options including Clouds On Beechmont and our modern Clouds Silver Lining. The chalet is fully self-contained which includes all the modern comforts needed for a tranquil and romantic getaway. - Two beautiful queen size bedrooms. - Dining and lounge areas, opening onto the huge deck. - Fully equipped kitchen with modern facilities. - High definition TV with DVD and DVD library. RELAX AND UNWIND!! Enjoy bush walking, visit local wineries and galleries, listen to music or just watch a DVD. View the hang gliders and eagles overhead... Various markets in the area including Mudgeeraba, Beechmont and Mt Tambourine. Could not believe we had a meal ( for 4) + lots of other goodies in fridge when we arrived. Chalet was excellent and we had everything we needed without needing to bring much at all !! We had stayed in this property this month 14th for 2 nights. Property is located at best spot in Beechmont, nice lookout from property.. Owners are great people and very friendly. Places are very near by.. property itself located at nice place... Will sure recommend for a family with Kids or couple.. it is sure to go again.. Thanks Wilson and Christine to make our stay memorable.. Perfect!Thanks very much Christine and Wilson for making Clouds such a comfy hassle free break.All the inclusions were amazingly generous and every time I thought "I wonder if they've provided milk / sugar / coffee / dvds / postcards / sunscreen" I was amazed to find that you'd already thought of it for me.Thanks!